I went to the Stanford Shopping Center today, the center for casual, Californian, flowering luxury that it is. The best urns of glorious colored flowers to be found anywhere outside of manor house entryways. I was headed for Papyrus, for stationery. I have to write thank yous to some of my family back east. The High WASP mass market default paper company is Crane. That part was easy. I found these note cards. However, I was not comfortable. The lining of the envelope, although you cannot tell from this picture, is actually an opalescent blue. I tried to make my peace with it. For a few minutes. But I couldn't. High WASPs don't do opalescent before 6pm. 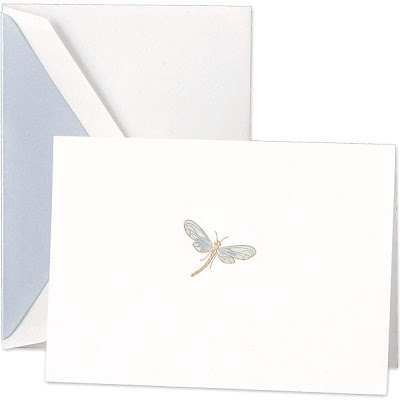 The dragonfly in real life is an Art Deco sort of gold, blue and greenish. So I bought these envelopes too. Celery lining. Phew. Crisis averted. Other acceptable options would have been plain cards with a gold pineapple. Or a gold bumblebee. But Papyrus didn't have them. So I went crazy with a colored dragonfly. It's tough making sure you keep to the code at all times. Unless you are gardening. Then it's an absolute free-for-all. 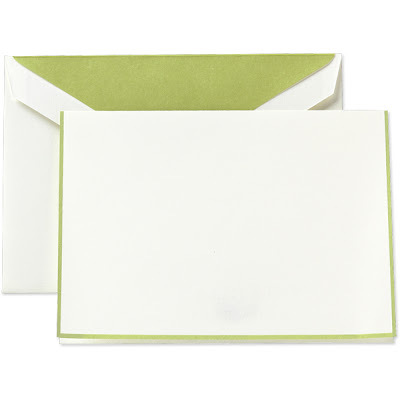 I like the second set of envelopes with the celery lining. I love that color. I like the gold pineapple idea. Good solution. The second set of envelopes is very nice. I am fond of gold bumbles. I knew you had good raising. Thank-you notes are to be written on paper and sent through the USPO. They are not to be emailed, or, worse yet, not done at all. If I do not get a thank-you note for the high school graduation presents I sent, there will be no college graduation presents. Yes, I am that mean. All of your posts just crack me up...and bring back awkward memories - like the time my mother introduced me to Crane's. Plain. Creme. No monogram. I think I was seven and the occasion was Christmas gift thank-yous. I wanted to comment just to say that I'm still reading - and thanks for checking in with my little site now and again. Expect an email at some point insofar as I'm dying to know how you are able to post about HW and reconcile that with being a HW at the same time. That being said, I think you could have pulled off the blue stationery. Growing up, we weren't even allowed to say the "W" word in my house - which made me a little louder, outspoken, rebellious, and embarrassed by it all...and yet now in my mid-thirties I'm coming back around and feeling a little conflicted about the whole thing. And PS - thanks for the (schooling) shoes w/ navy post. I love the celery lining. Of course, I always love envelopes with a lining of different color. This dragonfly is one of my favorites. It is an excellent example of the fine art of multi-color engraving. Love the celery. I love your discomfort with opalescence before 6pm. I am uncomfortable with opalescence at all times and highly approve of your buying separate envelopes. Smart thinking. I have those white and green cards!!! Crane & Co does a LOVELY gold embossed pineapple. You can find them in the social occacasion catalog at Paper Source and you can order them without writing on them, just the pineapple. OBSESSED! I know. Hehe. I saw the pineapple on the Crane site myself. AND a bumblebee...Mild obsession here too. If an obsession can be said to be mild. I see an actual Crane guy came and posted here. Do you think he would send us bumbles and pineapples galore if we asked nicely? I'm thinking not, but it's fun to imagine.